Family: Canidae Canis lupus familiarisPhoto Wiki Commons, couresty Petteri Sulonen. Like many types of Terriers, the Border Terrier is extremely skilled at hunting small game! The Border Terrier is a fairly young terrier breed. It was bred for fox hunting but has also been used to hunt a variety of other creatures such as rodents, otters and badger. Consequently this terrier, though quite mild-mannered, should not be trusted with other small pets, particularly rodents. It will get along with family cats though, if it is raised with them. Border Terriers are adored for their friendly and affectionate personalities. They make wonderful companions and family dogs, and are also popular as farm dogs due to their effectiveness in controlling vermin. They may be trained as watchdogs, and also excel at obedience, agility, and doing tricks. Because they shed very little, they are good dogs for allergy sufferers. When selecting a Border Terrier, it's important to check bloodlines for hip dysplasia and Canine Epileptoid Cramping Syndrome (CECS), also called Spike's Disease. Other potential health concerns include heart and eye problems. 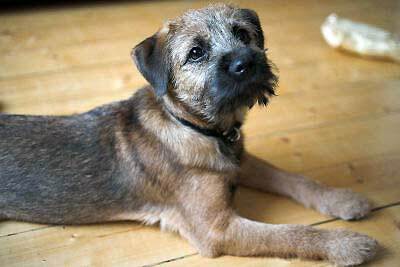 Breed Type The Border Terrier has all of the traits that are associated with the Terrier breed type. A skilled hunter of small game, the Border Terrier can live in a variety of climates. Background The Border Terrier's name comes from its origins in the Cheviot Hills area near the England/Scotland border. A fairly young breed, the Border Terrier was bred for fox hunting. It has also been used to hunt rodents, otters and badgers. Border Terriers were first recognized by the British Kennel Club in 1920, and by the American Kennel Club in 1930. Description Border Terriers have broad heads with short muzzles, dark eyes and noses, and small, pointed ears that fold forward. Their tails are somewhat short and tapered. The coat is coarse and comes in red, blue and tan, tan, and grizzle and tan. No white should be present, unless it is in a small patch on the chest. Male Border Terriers are 13 to 16 inches tall and weigh 13 to 16 pounds. Females are 11 to 14 inches tall and weigh 11 to 14 pounds. Care and Feeding A Border Terrier's diet should include horse meat, wheat, yellow corn and potatoes. Border Terriers should be brushed weekly, and professional grooming and hand stripping is recommended twice a year. Baths should be given only when necessary. Border Terriers shed very little, so they do not necessitate a lot of extra cleaning. They are good dogs for allergy sufferers. Housing Your Dog Border Terriers can live indoors in small spaces, as long as they get out for exercise regularly. A small yard is sufficient. It is important to keep them securely fenced in, because they are good at jumping and digging. Putting up a high fence with wire sunk into the ground at the fence line is advisable. This breed may eat small objects, so it's important to make sure toys are well constructed and can't be chewed apart easily. Social Behaviors Border terriers are affectionate and mild-mannered, and they do very well with considerate children. They usually get along well with strangers as long as they are properly socialized as puppies. They should not be trusted with small pets, particularly rodents, but will get along with family cats if it is raised with them. Handling and Training The Border Terrier is smart and eager to please, so training is usually fairly easy. They excel at obedience and doing tricks. This breed can be stubborn at times, however, so effective training will require some patience and firmness. Activities The active Border Terrier needs plenty of exercise to keep him happy and healthy. A long walk each day is crucial, and frequent off-leash playtime is recommended. Breeding/Reproduction Border Terriers have litters of two to eight puppies. When selecting a mate for your Border Terrier, check bloodlines for CECS and hip dysplasia. Common Health Problems The Border Terrier is generally a healthy breed. One disease that they are prone to is CECS, a mysterious illness that is often confused with epilepsy. Little is known about its cause. Symptoms include cramping, staggering, trembling and muscle contractions. Medical attention is important if you see these signs. Although there is no known cure, changes in diet could help reduce the occurrence of symptoms. Other problems to look for include juvenile cataracts, seizures, heart problems, and hip dysplasia. Availability Border Terriers are rather hard to find, but breeders may be located online. Prices are usually around $1,000.